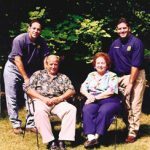 Frank E. Gamma, Sr., his wife, Genevieve, and sons Tom and Tim (standing L to R, respectively) have pledged $100,000 to the TREE Fund endowment to establish an arboricultural training fund. Tim Gamma, a former TREE Fund trustee, and his brother, Tom, wanted to honor their father’s hard work and dreams for the industry by establishing the Frank E. Gamma, Sr. Arboriculture Education Fund. Please make a gift to the Frank E. Gamma, Sr. Arboriculture Education Fund via the Donate Now button on the right.